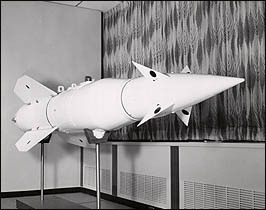 Bullpup was an air-to-surface missile designed in the 1960's for use against ground targets which required pinpoint delivery. It was developed by Martin Marietta and Maxson Electronics was contracted as a second supplier. Maxson eventually assumed all production of the Bullpup. There were two models, AGM-12B carrying a 250 pound high-explosive warhead, and the larger AGM-12C (seen here) carrying 1000 pounds of explosives or a nuclear warhead. Guidance for the Bullpup was of a visual nature. The pilot would locate the target, fire, and guide the missile to the target by means of a control stick connected to a radio transmitter. Bullpups were widely used during the latter part of the Vietnam War, being launched from F-105's and F-4's.